Review The Cape 7 Ion combines a single-core Intel Atom 230 processor with a Nvidia Ion graphics chipset in a tiny PC that measures 173 x 154 x 20mm - approximately the same size as a paperback book. Inside the casing there is a Fujitsu 2.5in laptop hard drive that was 80GB in the test sample but will be 160GB in production versions. The memory is 667MHz DDR 2, 1GB on the motherboard and 1GB in the Dimm slot, so there’s scope to upgrade the overall capacity to 3GB. You can sit the Cape 7 Ion flat on the table, mount it vertically on the supplied stand or use the supplied Vesa mount to attach the PC to the back of your display. I like the way that you squeeze the corner of the case to activate the machine, but I could happily live without the piercing blue LED strip that tells you the system is running. While the review sample had a native HDMI port, production models have a DVI-I output and come with a DVI-to-HDMI adaptor in the box. The Ion's graphics core is perfectly capable of decoding HD movies. However, the single-core Atom 230, despite its use of Hyper Threading to make it look like a two-core part, is feeble and barely up to the job of running full Windows 7. On the bright sid, it means that the Cape 7 Ion is amazingly cool and quiet in operation. If you’re considering this PC you may do well to look at the £240 version that comes without an OS and install Linux instead of Windows 7 Home Premium. 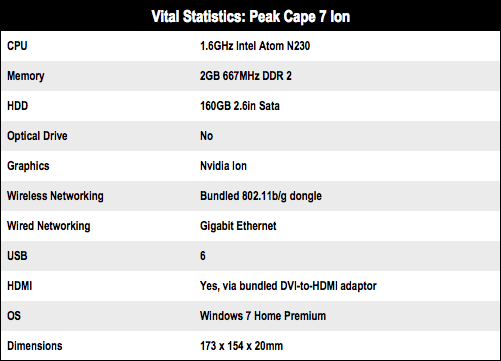 The Cape 7 Ion has the potential to be a nifty PC despite its tiny size, but Windows 7 demands too much from the Atom 230 CPU. 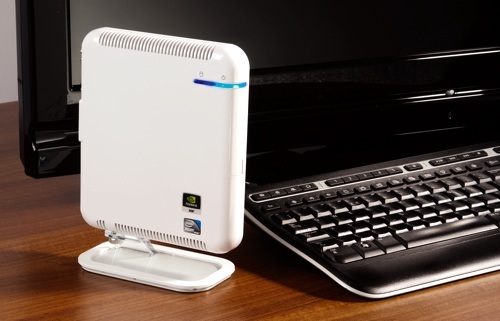 Skinny Atom-based mini PC that's ready for nettop duties and - thanks to Nvidia's Ion - HD video viewing too.